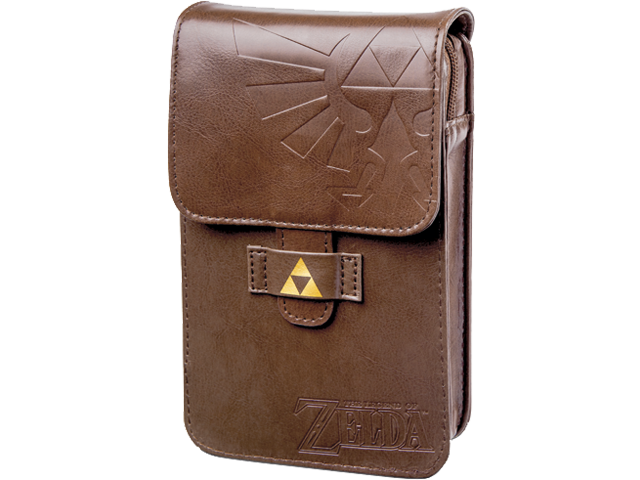 Protect Your Nintendo 3DS with This Legend of Zelda™ Adventurer's Pouch! The pouch includes a detailed Hyrule Map peel and stick cleaning cloth, a legendary 3D molded Master Sword stylus and an iconic 3D molded Hylian Shield stylus. The faux leather exterior features the Hylian Royal Family Crest and a shining Triforce symbol as well as a snap-on belt loop. The interior has slots for 2 game card and 2 styluses and is compatible with the New Nintendo 3DS™ XL, Nintendo 3DS™ XL, 3DS, DSi XL™, DSi™, DS™ Lite, and original DS. *3DS and game cards not included.